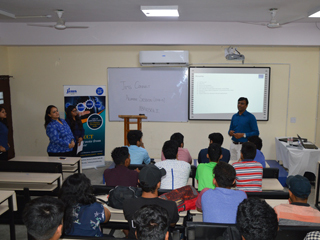 Department of Information Technology, JIMS Rohini organized a session of Alumni Interaction Series on 22th September, 2018 from 12:00 noon to 02:00 pm for BBA-II year students. 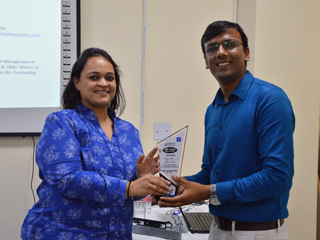 Mr. Vinay Jain (BBA 2005-08) delivered a session on “INDIA: The Wheel of Fortune”. ALUMNI CONNECT is a significant platform which gives students the opportunity to hear from their seniors about their journey and experiences from college to the corporate world. Mr. Vinay Jain is currently working in “Client Associates” as Research Associate in Gurugram. He is 5 Times Winner of CNBC TV-18 Best Financial Advisors Award 2015, 2014, 2012, 2009 & 2008. 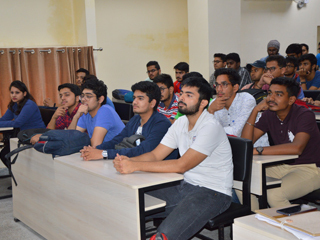 He acted as the guiding spirit by making students aware of the various facts and giving examples of demonetization telling how company works and how management is done in specific fields like banking sector, funds raising for projects, telling about risk management, wealth management, equity research, business analytics, algorithms trading. He also talked about the major skills set required for a person to seek jobs, discussing about resume writing. He emphasized on “people handling skills”. 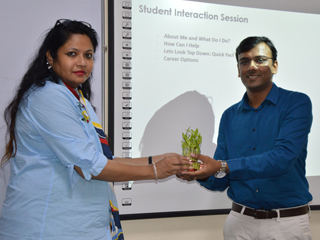 He told many of his experiences in corporate world which helped students getting idea how work in corporate is done. It was an interactive session with lot of queries from students to their session speaker.